... That a rocket scientist turned health strategist is helping to pioneer new detoxification protocols for heavy metal poisoning based on scientific inquiry into ancient man? Roy Mankovitz, author of "The Wellness Project, A Rocket Scientist's Blueprint for Health", offers a compelling exploration into human health and wellness. What makes this treatise on human nutrition different? It is based on applied scientific theory and principles, centered upon the original successful survival instincts of human kind, traced back to an era before mankind was smart enough to interfere with nature. A clay poultice or pack or cataplasm is the most common use of healing clays in natural medicine. It is actually very easy to prepare clay for use as a poultice provided that one remembers that each clay is different, and each requires different amounts of water to properly hydrate. 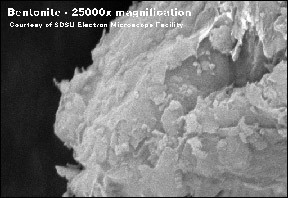 Swelling sodium bentonite clays usually require 3 to 4 parts water to one part clay, by volume. One need not have exact measurements in order to properly hydrate clay. 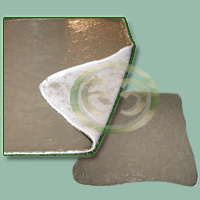 The ideal clay poultice is hydrated to the point where the clay barely holds together, as a gel, without falling apart. 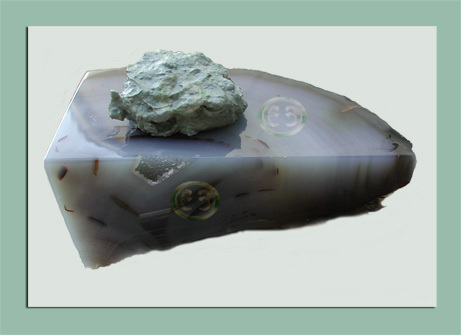 It is easily malleable, yet will hold its shape without difficulty. After setting, the clay should be without large, dry, clumps, although a few small clumps in clay will not pose any real problem. For general use, "a palm of clay" is the right amount of clay for a poultice for a small treatment area with a duration of 30 minutes to a few hours. 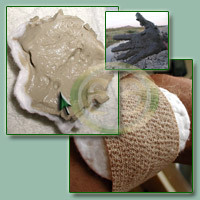 A very large palm of clay can be used for longer treatment periods or for areas that are larger treatment sites. This is a "Large Palm of Clay" (about 1.25 inches thick) prepared for a 4-5 hour arm poultice. Clay can be placed on a clean cloth dressing first, and then gently applied to the treatment site, or clay can be applied to the area first, and then covered with a clean, colorless cloth or sterile gauze. There are many different methods to use clay poultices. As a general rule, the clay should be placed on a clean dressing, 1/4 - 3/4 of an inch thick (sometimes a bit thicker for very longer treatments), and sized so that the clay covers the entire area to be treated, plus about one to two inches overlapping. The overlapping is important when considering the energetic effects that clay may have upon the body (in particular, the clay's field characteristics). The dressing is then gently placed upon the body, with the clay directly on the area to be treated. The dressing is then gently secured, in a manner that does not place undue downward pressure on the clay. Some people find that using conforming plastics (like saran wrap) makes securing clay to the body very easy and convenient. This is certainly true, and may be indicated in situations where securing the dressing to the body is otherwise not possible. For overnight treatments, to prevent the clay from drying, insulating the treatment site with plastic is also acceptable. However, we believe it is best to be certain that the dressing is still in place, which provides the clay and body with breathing room, and makes certain that the plastic is not directly touching the clay. The next question is not as easy to answer, cart-blanche: How long does one leave the clay on the body? There are a variety of answers to this question. When treating areas near important organs, the first treatment should generally be done for no longer than 20 minutes to test the body's tolerance. 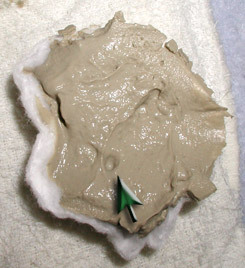 Subsequent treatments may last from 20 minutes to an hour, or longer if the clay is being "worn". However, it is important to "check the body" after each treatment. Prolonged clay treatments have a very deep effect on the body when used near organs, and clay treatments can cumulatively cause increasing levels of fatigue. One must listen to the body in order to know when -- and for how long-- to break. Personal experience is the best teacher. It is good to remember that clay much of clays healing effect is clay working with the body, rather than on the body. Another answer to this question: Until it stops hurting. When treating wounds, cuts, stings, bites, abrasions, infections, etc., clay should be repeatedly used at least until the body indicates that all is well. When treating the legs, arms, hands or feet, repeated treatments, lasting anywhere from 20 minutes to a several hours are fine to do. Overnight treatments are often excellent due to the convenience (use enough clay to prevent the clay from drying in the wound). Clay does "get used up". 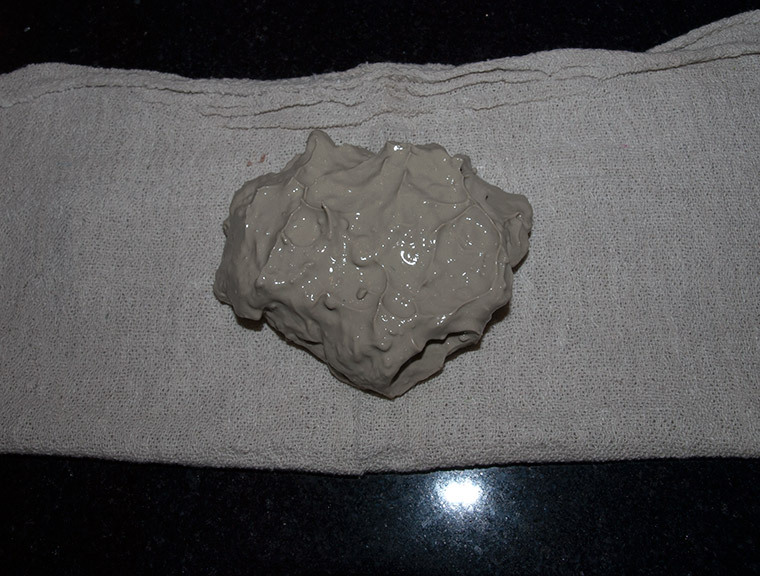 For an average poultice, clay action is much reduced at about the two hour mark. 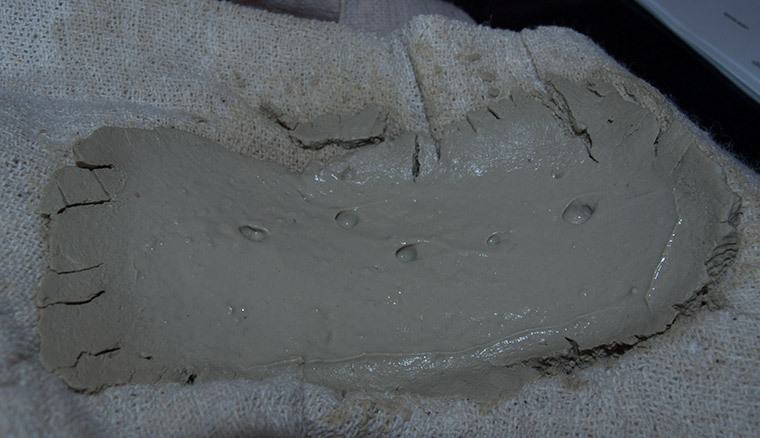 After four hours, the effect is significantly diminished, even if the clay remains properly moist. Another answer to this question: Until the clay is ready to come off! When the clay has finished its action, it will literally fall off on its own (it will seperate from the body). Different clays have different hydration levels, and thus will remain active for different lengths of time. However, you cannot let the moistness of a clay be the only indicator as to when clay should be removed. 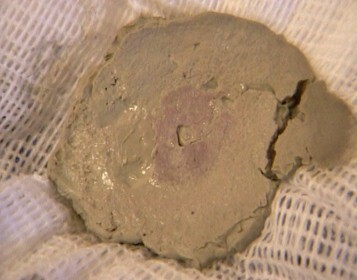 With some infections, clay will stay moist, but it will become so contaminated that it will lose its healing ability. In such situations, changing the clay out sooner is critical! 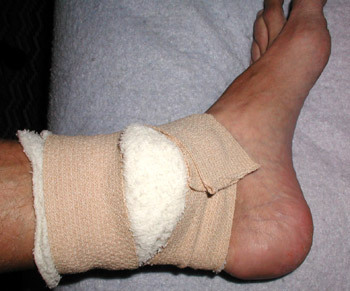 If a wound is draining at all, the clay needs to be changed out and discarded more often. The final answer: Use common sense. If a play pack causes any shock to the body, then the clay should be removed immediately and reapplied once the body recovers. While not widely used in modern Ayurvedic Medicine, as Anjou Musafir and Pascal Chazot note in their book "Clay Cures", some Ayurvedic practitioners are extremely adept at clay therapeutics, and it is likely that clay was used by ancient practitioners..
Clay is generally considered "sama", and as such, useful for all three doshas as a balancing agent. One example of a clay cataplasm ayurvedic treatment is the upper arm clay poultice. 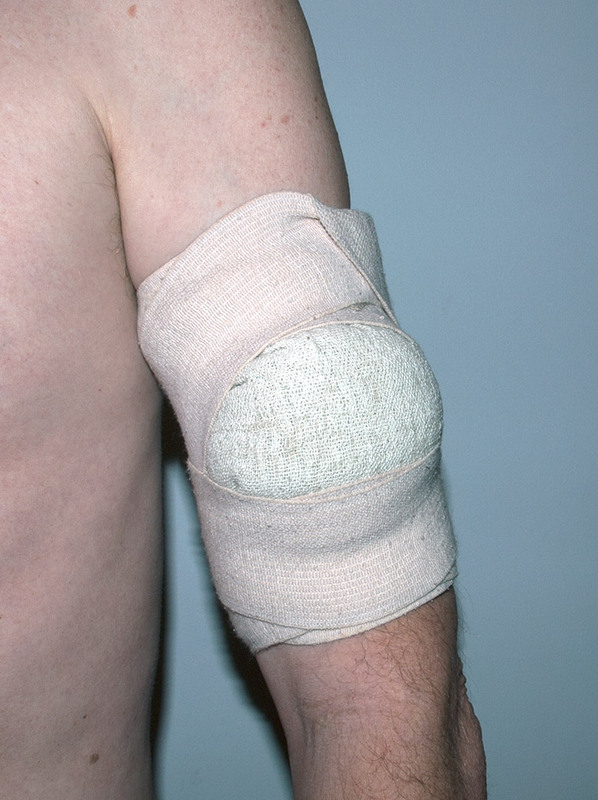 A palm of clay is secured by a clean dressing to the upper arm, twice daily, and left on between one and four hours per treatment (see the images of the arm poultice above). This method has been used to stimulate systemic healing, stimulate thyroid function, as a part of a cancer treatment protocol, to treat diabetes, and generally as a balancing agent in the body. 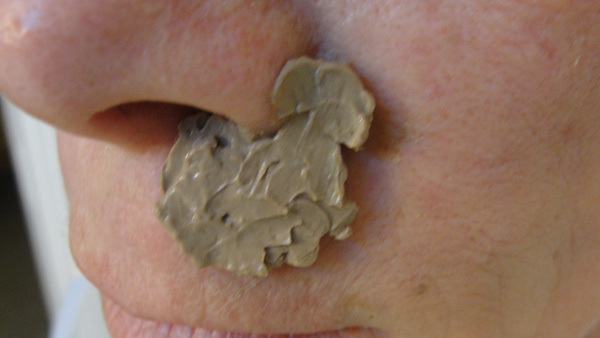 It has been observed that clay treatment is particularly successful when a rash appears after the treatment. To treat infectious conditions, the cataplasm is often placed on the forehead. 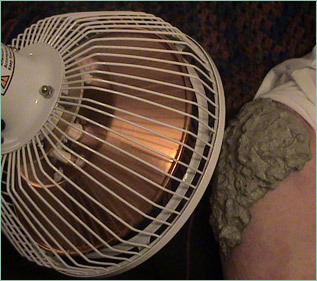 This method has been successfully used in the recovery of severe flu and other serious accute infections. Ghandi was a well known clay enthusiast, and used clay packs on the lower abdomen to regulate digestion and prevent constipation. We will often use Organic Triphala along with edible clays to treat sluggish digestive systems. Follow this link to learn how to make an amazing hydrated clay gel using remineralized, structured water. Follow this link to purchase bulk/wholesale quantities of prehydrated clay. This is perfect if you have limited space or time to make your own. When possible, however, we always recommend that you make your own hydrated clay gel!